with eyes as blue as forget-me-nots and hair that shone like gold. on lazy summer afternoons with cloudless clear blue skies. she heard a gentle sobbing sound and saw an awful sight. with tears running down her face and twigs stuck in her curls. and as she whispered in her ear her eyes did open wide. if you could smile and dry your eyes I would be very glad." looking for the little voice that made this little sound. the little girl just sat and stared, she could not understand. is there something I can do, or is it far too late?" "The other girls were teasing me and pushed me in a bush." the little girl said sheepishly and then began to blush. that is why I'm sitting here, crying on my own." "What a horrid thing to do, I'm not surprised you're sad! If I was pushed into a bush, I would be very mad. 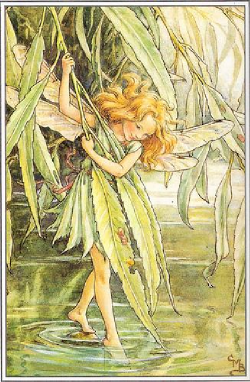 there are fairies hidden in the garden, in every cranny and nook." and blew some sparkling fairy dust into the girl's teary eyes. she couldn't quite believe her eyes at what she saw just then. but seemed to sort of disappear the moment that she glanced. They had pretty wings and plaited hair and held long daisy chains. They laughed and sang and danced around as they played their little games. for fairies always can be found wherever flowers grow." and sat beneath the apple tree, just watching for a while. Dedicated to Willow on her 1st birthday. Fairy Willow Milly Mary by Ben Francis is licensed under a Creative Commons Attribution-ShareAlike 2.0 UK: England & Wales License.